I saw my first rehearsal run of Jacob Marley’s Christmas Carol on Skype; the second I watched on FaceTime. The Ghost of Christmas Past was particularly ghost-like and scary through the blurry Skype connection; FaceTime provided a clearer picture albeit with frequent lost connections… but I’m not here to write about the relative merits of the two services. I would like to share a little about what it’s like to be an out-of-town designer coming to work at the Gulfshore Playhouse in beautiful Naples, Florida. My name is Christopher Colucci and I am a Composer, Sound Designer and Guitarist from Philadelphia. I’m currently working on Jacob Marley’s Christmas Carol. It’s my first time working here at the Gulfshore, or second, depending upon how you look at it. My sound design for The Whipping Man was here last season but I was not. In that particular case a talented local sound engineer facilitated the transfer of my design from the Arden Theater in Philadelphia where I first worked on the show with Gulfshore Artistic Associate, Cody Nickell, who also happens to be the actor playing Jacob Marley, as well as all 17 other characters in this production! Of course, living in Philadelphia made attending Marley rehearsals in Naples impossible so our challenge was to develop a shared vocabulary and common vision in spite of the distance. The first time I met director, Kristen Coury was on Skype, and it was at this virtual meeting where we began talking about our ideas for the play. In the month that followed I sent her dozens and dozens of sound files attached to scores of emails with my ideas for the Marley music and sound effects. Kristen tried them out in rehearsal. Some she liked a lot; others not so much. I learned a great deal from both responses, and over the next few weeks, and in spite of our having never met, we gradually built a common language. We began talking about “magic wand” sounds, ghostly tones, costermongers, as well as how we wanted the various levels of Hell to sound. The spirit of collaboration overcame the miles. All that work happened while I was in still in Philadelphia. When I finally arrived in Naples (my goodness, what nice weather you have here!) 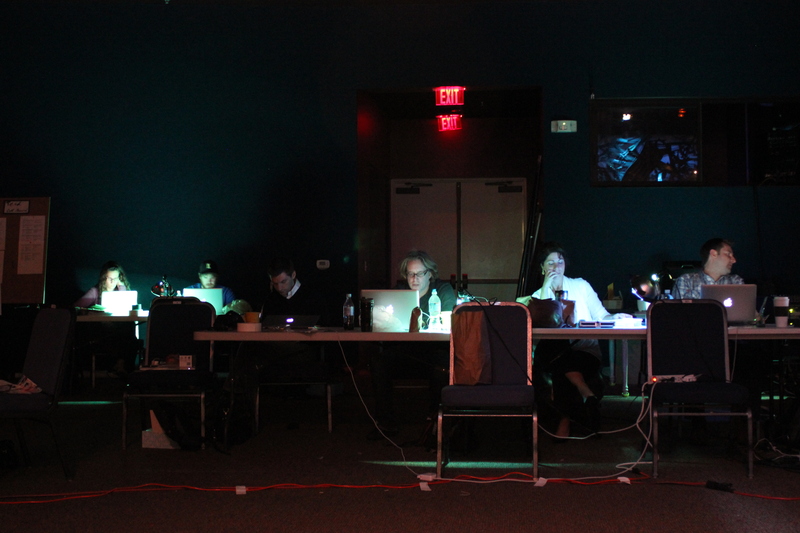 at the beginning of our tech process, my work got joined up with the work of the entire Gulfshore organization; the production and office staff, as well as the artistic team; all of whom have also been working on the show for months before there is ever an audience. Then we made the show together, finally all in the same room.